When you map your processes in the system, the Team Workflow gives you the unique possibility to stay flexible on a team level and have a high-level overview across all the teams on a project level without confusing each team’s specific workflow. However, there are many scenarios for how your teams can organize a work process while running their projects. Depending on your case, we recommend that you consider using different setups. This is the simplest case when it is enough to use Project Workflows and not overcomplicate your setup creating Team Workflows. A project workflow is a default workflow which different entities use in a project. Since it is associated with a project, all people and teams who work on a single project will use the same project workflows for different entity types. 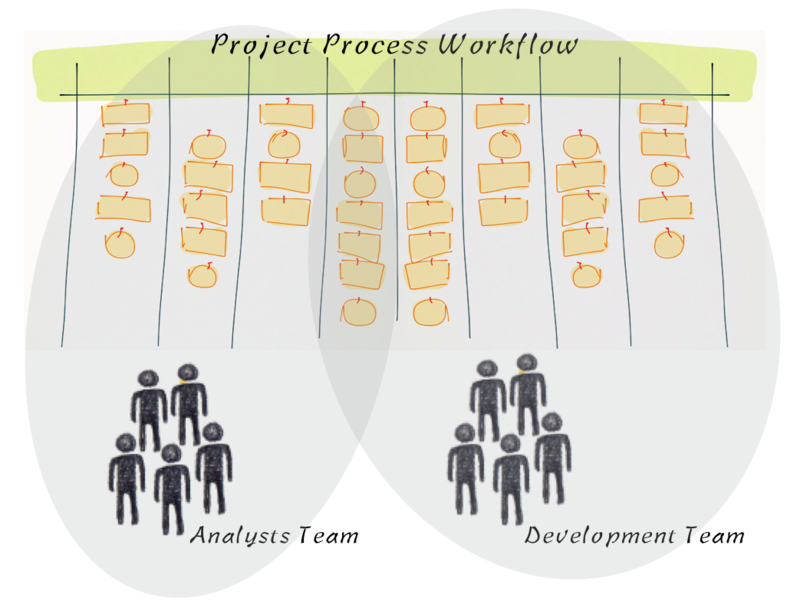 Read more about differences between a project and a team workflow here. For example, we develop a big product which consists of many components. There are several component teams, each of which is responsible for the development of its module. Teams have different states while a project manager is interested in the high-level picture. To reflect this case in the system we can add two team workflows for each of the component teams under the project workflow. On the picture below the project workflow has 4 states: Open - Planned - In Progress - Done. The Reporting team then has a custom workflow: UX - Design - Planned - HTML - In Progress - In Testing - Tested - Released. 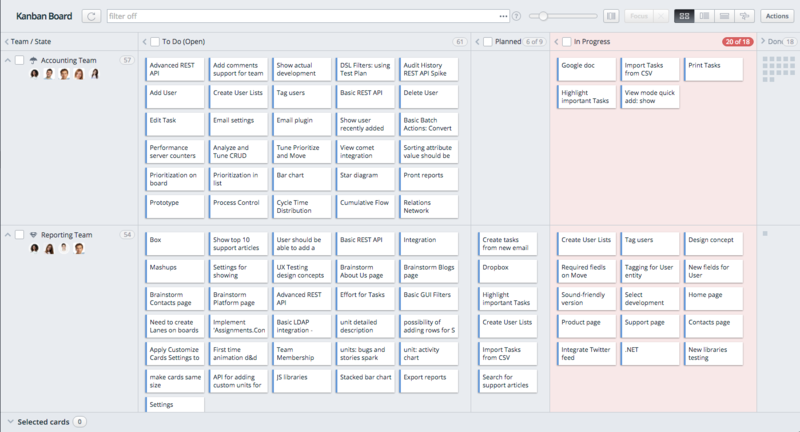 A project manager uses a Kanban board which shows all user stories of the project. The vertical lanes are Project States and the horizontal lanes are Teams. 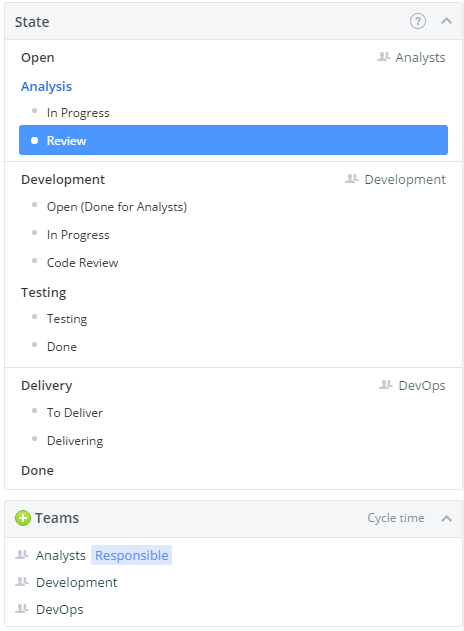 This view allows a viewer to track progress of the entire product backlog and see which team is working on what. Each team then uses its own Kanban board where the Team State is selected as the vertical lanes. On the view below, the Reporting Team moves user stories through the states of the custom Reporting team workflow. 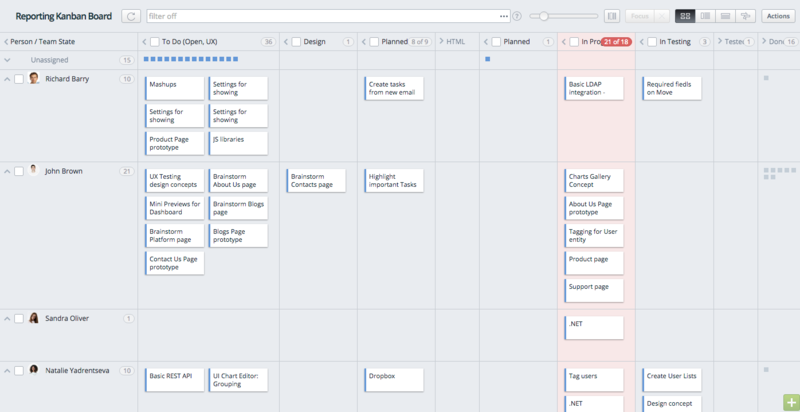 The project and team workflows are synchronized. When the Reporting team moves a user story from the Design to the Planned state, it will be moved to the Planned project state automatically. Read more about how to set up and customize a team workflow. We naturally support sequentially working teams. The most usual case for such teams is functional teams. A typical functional team consists of people performing similar functions. They are responsible for different phases of work and usually work sequentially like pipeline. 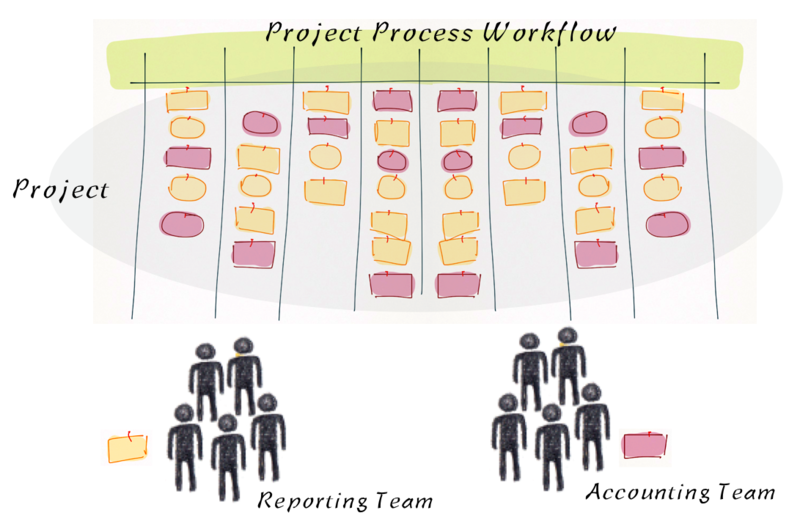 Only teams responsible for different segments of workflow may work on the same work item. So if workflow is not customized for a team, it may not be assigned to work item with other teams. Read more about a team workflows. The main rule for the team workflows when multiple teams work on a work item is that they shouldn’t overlap with each other. With one exception, the final state for one team can overlap with the initial state for another. For example, we have Analysts, Development and DevOps teams working sequentially on a user story in one project. The work starts from the Analysts team. When the Analysts team moves a user story to the state which is final for it, this is a moment when the Development team takes the responsibility for it. Once a user story is in a state which is related to a particular team you can see the Responsible icon next to the team’s name. It means that a team is working on an entity at the moment and therefore control it. 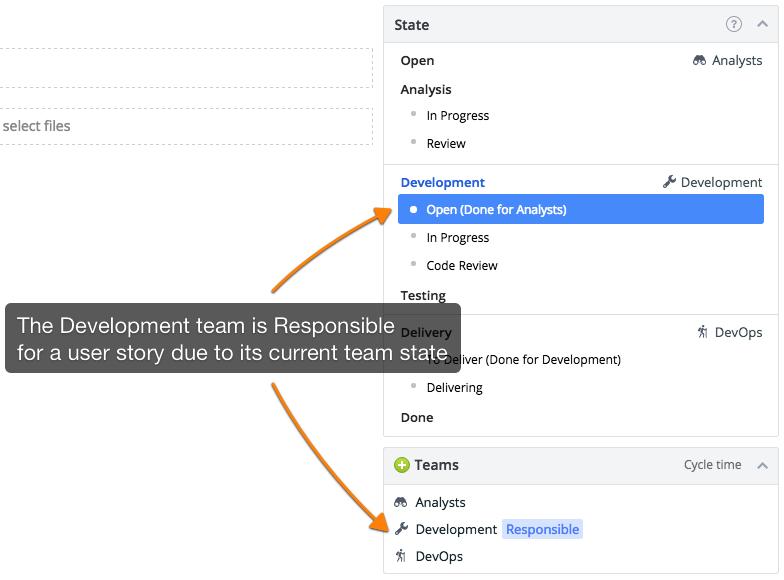 In the example above the Analysts team is marked as Responsible because the user story is in the Review Analysts’s state. The team state axis merges workflows for all teams selected in the Project/Team context. We recommend to select teams which use the same workflows to have a clear view of the progress. Note: The entities, related to states that are out of the team responsibility, are not displayed on a Team’s Kanban board. 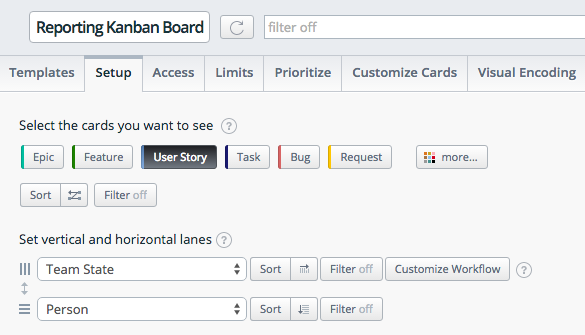 We recommend to use a Project Kanban board to see all items. This case is not supported as workflows of teams working on the same items shouldn’t overlap with each other. With one exception, the final state for one team can overlap with the initial state for another. We would be glad to know more details if this case is relevant to you, so please don’t hesitate to share your thoughts and ideas in our voting system. For example, there is a feature and 2 teams working on user stories related to it. Since teams don’t move a feature from one state to another, teams don’t have team workflows created at the Feature level. As result you can assign user stories of the feature to different teams, but you cannot assign multiple teams to this feature itself. We call this case “Multiple teams work on a container” as the teams don’t move a parent entity through its states but are responsible for children entities inside it. If you need to have a visibility of assigned teams on a parent level, please let us know your case leaving your vote and comments for the corresponding idea in our system. When can I assign several teams to an entity? To assign several teams to an entity each team should use a team workflow. Targetprocess supports the scenario when teams work on the same item one after another (functional teams). A typical functional team consists of people performing similar functions. They are responsible for different phases of work and usually work sequentially like pipeline. Each team should use its own team workflow working on this entity's project. It is not possible to assign teams if any of them use a project workflow but not a team workflow. Assigned teams should be responsible for different parts of an entity’s workflow. Two workflows shouldn’t overlap with each other. They can overlap only when you have the Final state of the first team workflow with any number of states of the second team workflows. For example, on the image below Analysts and Development teams won’t be able to work on the same item as more than one states of the Analysts workflow overlap with states of the Development workflow. The correct mapping is when only one Final state of the Analysts workflow overlaps with one or many states of the Development Workflow. Why don’t I see all entities assigned to my team on the Team Kanban board? How many states can I have for a team workflow? A Team Workflow must have at least two states: an Initial to start work and a Final to complete it. What if a team has a gap in its team workflow? Please note that when mapping team workflow states to project workflow states you can start from any project state, but there cannot be any gaps in a team workflow. You should map all team states that are between the Initial and Final team states of a team workflow to the corresponding project states. a view with project states to see items outside of a team workflow. a view with team states to see items a team is responsible for now. Can my team work with several team workflows simultaneously? Yes, just select different team workflows for a team on different projects it works on. Can teams plan the same item to different team iterations or releases? It is not supported. You can leave your vote for the corresponding idea in our system. How does a team workflow correspond to a project workflow? A team workflow is a sub-workflow of the main project workflow. It is used by a team when it works on projects tied to this project workflow. It means that an entity can have two states: the main project state and the sub team state. It gives you freedom to choose between a project or a team perspective to track the progress depending on the level of required drilldown.